Eye-hand coordination development typically occurs through movement, beginning at a very young age. The visual components of oculomotor skills (how the eyes move) include visual fixation, visual tracking, and visual scanning. These beginning stages of child development play a big part down the road in taking in visual information and using it to perform motor tasks. Wondering about a child who uses both hands to write or perform tasks? Maybe you know a child who uses both hands equally and with equal skill. Perhaps your child uses one hand for specific tasks and their other hand for other tasks. How do you know if your child is ambidextrous or if they are showing signs of mixed dominance? This post will explain a little more about ambidexterity as well as mixed dominance and what it means in motor skills. 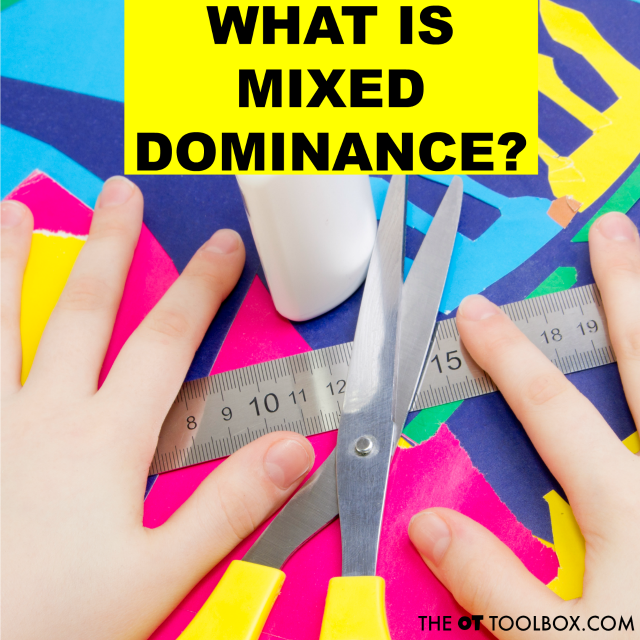 Just yesterday on The OT Toolbox, we discussed mixed dominance. In this post, we will cover more about true ambidexterity and what that means. Is my child ambidextrous? Isn’t that what mixed dominance is? These are two questions that therapists get asked frequently when evaluating a child for the first time for mixed dominance and other concerns. The answer is no, they are not the same thing. A child with mixed dominance demonstrates clear, stronger patterns based on the side of the body they are utilizing to complete the task. For example, a child who is left hand dominant will develop a stronger fine motor pattern then a child who is not left side dominant but compensating for fatigue and is moderately adept at utilizing the left hand as a coping skill. A child who is truly ambidextrous will be equally as skilled at utilizing both sides of the body and it will look and feel natural to the child. 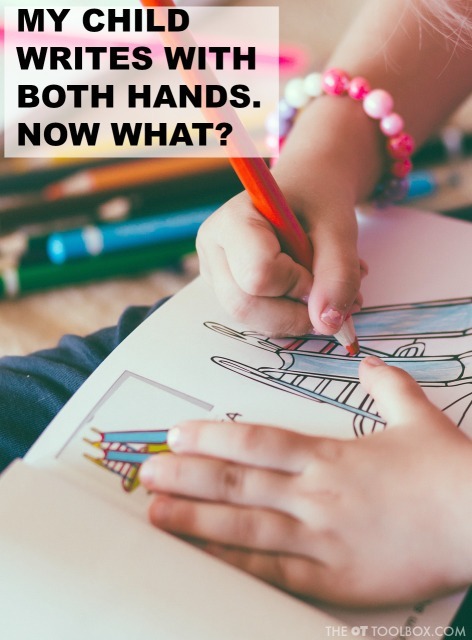 Statistically, only 1% of the population is truly ambidextrous—it’s really very rare, and it is more likely that your child is experiencing mixed dominance patterns. True ambidexterity requires both hands to be used with equal precision and there is no true preference in either the right or left hand for either both fine or gross motor tasks. This is a tricky area. 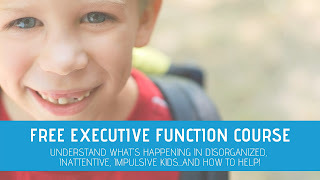 Therapists recognize mixed dominance as a miscommunication or poor integration of the left and right sides of the brain and that’s how it’s explained to parents. However, there is a lot of information out there on this topic that may or may not be relevant to your child and her struggles— keep this in mind when Googling information. It is more likely, that your child’s brain is utilizing the left and right sides for very specific motor skills such as writing, eating and throwing a ball. This can lead to motor confusion—this is where the poor integration and lack of communication between the left and right sides of the brain comes into play. When the child is not utilizing one side of the brain more dominantly for motor patterns, confusion and poor motor learning occur leading to delays and deficits in motor skills. It is unclear why the brain develops this way, but it does happen, and it is okay. In fact, it is easily addressed by an occupational therapist. I already touched on this a little, but a child with mixed dominance may switch sides for task completion when experiencing fatigue. Due to this, their motor development and precision is typically delayed. The most common area that this is noted in is in fine motor development for handwriting. This is because the child is equally, but poorly skilled with both hands, and will switch hands to compensate for fatigue. Motor delays may also be noticed later on when it comes to the reciprocal movements needed to throw/catch or kick a ball and when skipping. A child with mixed dominance may attempt to catch and throw with the same hand, hold a bat with a backwards grip, or stand on the opposite side of the plate when hitting. They may also experience a moderate level of confusion, and frustration as they are unsure of how to make the two sides of their body work together leading to overall poor hand/foot-eye coordination skills. Have you ever wondered is my child a lefty or a righty? Or been asked if they are a lefty or righty and unable to answer? Have you noticed that your child seems to use both hands equally when writing? 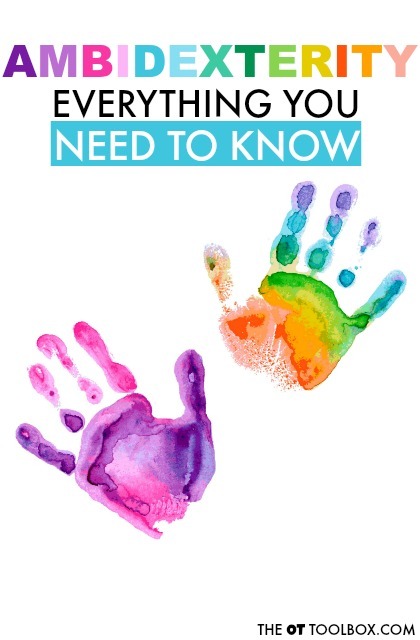 If so, your child may be experiencing mixed hand dominance patterns or cross-dominance, and this is why you are not sure if they are a lefty or a righty. Writing with both hands can have implications that affect handwriting. Read on for information on using both hands to write writing and what you need to know about mixed-handedness. My Child Uses Both Hands to Write—Now What? First, it's important to understand what is happening when a student uses both hands to write. Let's discuss mixed dominance to begin. Here is more information about hand dominance and activities to promote laterality. 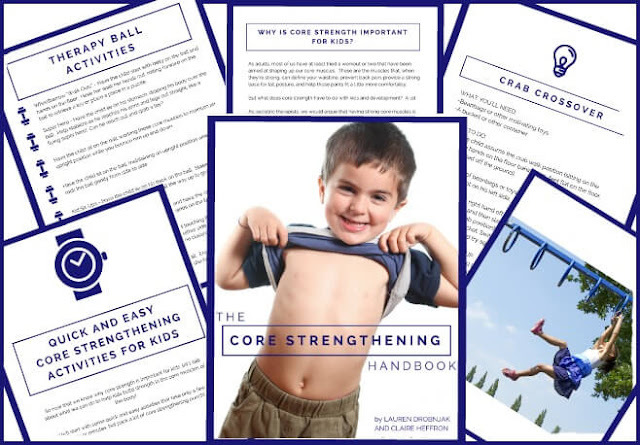 Mixed dominance refers to when a child does not demonstrate a strong preference for either the left side or the right side of the body for completion of activities, or clearly utilizes both hands for specific sets of activities. For example, a kiddo might throw with his left hand, but write with his right hand. It should also be noted that children with mixed dominance often utilize both sides of the body equally, but poorly. When they fatigue, this leads to confusion with if they are left-side dominant or right-side dominant. Dominance of one side of the body or the other is not expected until 5 years of age. Before the age of 5 years old, use of both hands is expected to a moderate degree. However, most children are showing a strong preference for one hand or the other by 3.5-4 years of age. Dominance is typically determined through observation of the eyes, hands and feet and which one the child uses for task completion. For example, a child who is demonstrating mixed dominance may be right eye dominant, and left hand/foot dominant or left eye dominant, right hand dominant and left foot dominant, or any combination of these characteristics. Therapists may utilize the Jordan Left/Right Reversal Questionnaire or clinical observations to help them determine mixed dominance. In a vision screen, the therapist can have the child pretend to be a pirate, and see what eye they close when looking through a tube/rolled paper. The eye that the child closes is the non-dominant or “weak” eye and the dominant or “strong” eye is the open one. If the “strong” eye does not match the hand preference the child has been showing, this is mixed dominance in action. Be sure to watch this space, because tomorrow we'll cover more about writing with both hands, ambidexterity, and mixed dominance. Children who experience mixed dominance patterns are often delayed in reading and writing skills, along with poor left/right awareness. Poor left/right awareness can affect their ability to accurately form letters and result in ‘dyslexia’ looking reversal patterns. The reversal patterns in letter formation and recognition may also lead to poor phonemic awareness, and later poor spelling, further delaying their reading and writing skills. Reading left to right may also be a significant challenge as a result of poor eye teaming, as both sides of the brain are attempting to ‘dominate’ the skill. This struggle between the two sides of the brain results in poor organization of the information and retrieval of phonemic rules. Here is more information about visual processing and the skills that impact reading and learning. Difficulties in these areas can be red flags of mixed dominance patterns that need to be addressed. 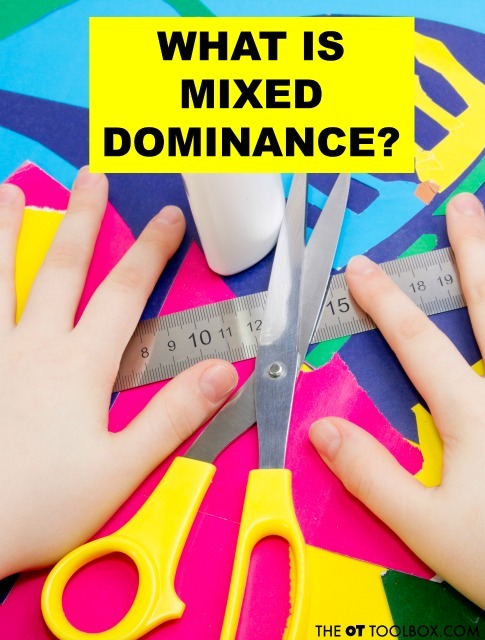 Mixed dominance does not always seem like a big deal, but when left unaddressed your child may be left frustrated with their struggles in gross motor play, reading and writing. Struggles in these areas significantly impact a child’s self-esteem and desire to participate in age appropriate activities. Fortunately, mixed dominance can be easily addressed through therapy. Try this pouring and scooping activity to refine hand dominance in functional tasks. This has been a fun week on The OT Toolbox! We've been celebrating all things Spring with activities geared toward developing various underlying skills that kids need. 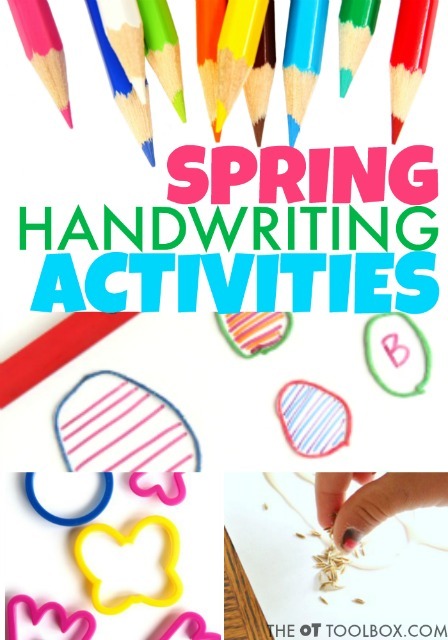 Today we're covering Spring Handwriting Activities and ways to promote legible handwriting with a spring theme. These are handwriting activities that you can use to work on letter formation, spacing between letters and words, size awareness, and line use. All of this reflects back on handwriting legibility! And, when it comes to working on handwriting, we're striving to make practice fun and NOT boring! 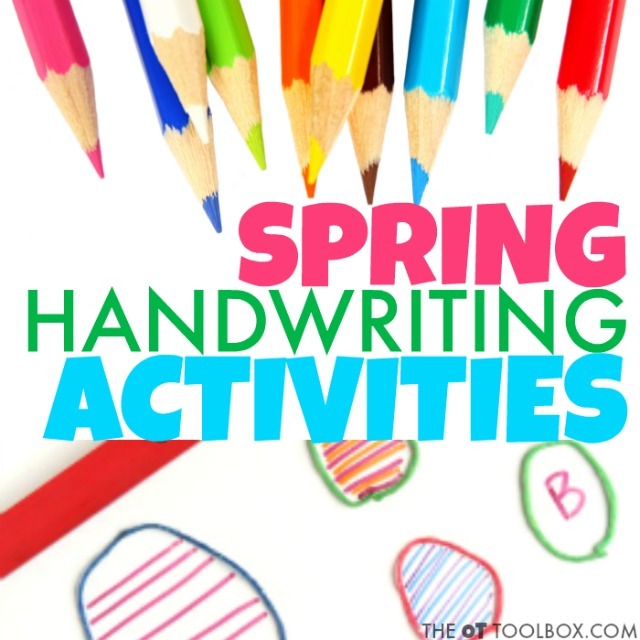 Read on for some Spring handwriting ideas the kids will love! 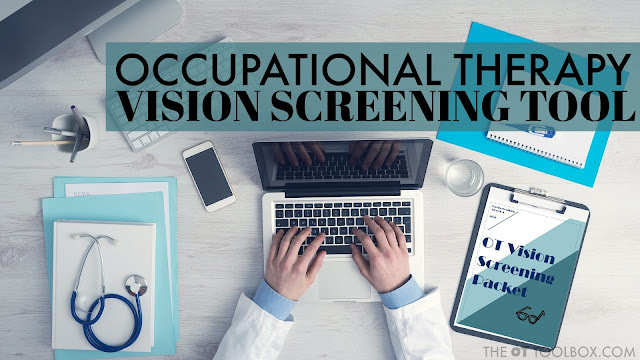 First, if you missed the other topics we've covered this week on The OT Toolbox, you'll want to check out our Spring Occupational Therapy Activities page. 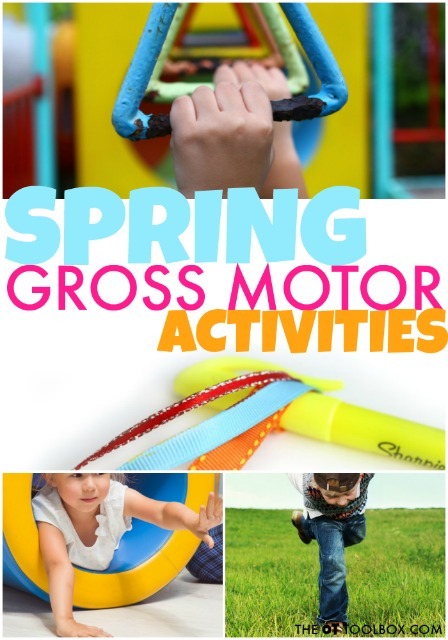 You'll find Spring fine motor activities, gross motor activities, sensory activities, and visual perceptual activities. All of the ideas are Spring-themed and will keep the kids occupied and working on various skills all Spring long. And, if you are interested in really addressing the underlying skills that play into development and functional skills, be sure to grab the Spring Occupational Therapy Activities Packet for tons of ideas that cover a variety of areas, and are graded to address other areas or other levels. Get the Spring Occupational Therapy packet HERE. Now, onto the handwriting ideas! When it comes to handwriting, sometimes you just have to make it fun. Practicing letter formation or copying skills can be downright boring. For the child that struggles with these skills, self-confidence can really play into practice. When a child knows they struggle with certain aspects of written work such as letter formation or reversals, it can be hard to get them to want to practice, making home programs or any written work a real struggle. That's why I wanted to pull together some extra-creative and fun ways to practice written work. Kids will like this pre-writing lines activity that doubles as a way to work on letter formation and spatial awareness. We created eggs with wikki stix, but you can definitely modify this activity to a slower theme for those working in schools who can't cover anything egg or Easter. Do you have any Spring cookie cutters? If not, you can usually find them in dollar stores this time of year. Use butterfly and flower cookie cutters to work on handwriting skills like spatial awareness and line awareness needed for legible written work. 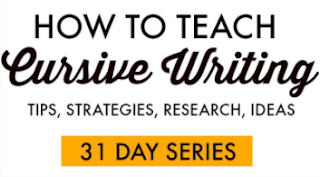 This is a great writing warm-up activity this time of year. This time of year is all about growth, seeds, and new development. Pull together a spring theme with seeds and work on pincer grasp, in-hand manipulation, separation of the sides of the hand with letter formation! Kids can manipulate small seeds like grass seed to form letters or work on the letters of their name like we did in this Grass Seed Handwriting Activity. Then, lay the paper on newspaper, sprinkle dirt on top and see if it grows name-shaped grass in a week or so! Celebrate spring with rainbows! Pull out the colored chalk to work on letter formation with rainbow writing. On a warmer Spring day, go on out to a sidewalk, driveway, or blacktop surface to gain the resistive input of drawing with chalk on the ground. It's a great way to really incorporate the motor planning needed for letter formation! Finally, a great way to work on handwriting is with lists. With a list of writing practice, kids who struggle with written work tend to not feel so overwhelmed. Writing out a list of words to practice aspects such as letter formation. line use, spacing, and letter size can be more beneficial than copying a few sentences. Granted, there is a time and place for copy work, too. It's an exercise in visual motor skills, visual tracking, visual memory, and so many other skills. But, when a child needs to write a paragraph AND come up with sentence structure, grammer, capitalization and punctuation, content flow, and comprehension, legible handwriting can be the first to go! We've all seen the child that can write the whole alphabet with complete accuracy, but then writes a journal prompt with letters all over the place! That's why I put together the list of list writing prompts in the Spring Occupational Therapy Activity Packet. 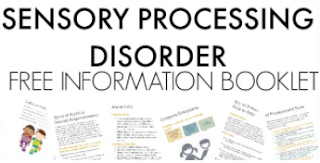 There are two full pages of prompts in card format, so you can cut out the cards and use them over and over again with the whole therapy caseload. Best yet is that these list prompts encourage motivational writing in that they have many "favorites" or "Best things about..." included. Many kids love to tell others about their favorite things. They can write them out in a list form, AND work on the handwriting skills they need! Have you been following along with the Spring Week activities this week? All week long we're covering various aspects of development and function with fun and creative spring-themed ideas. 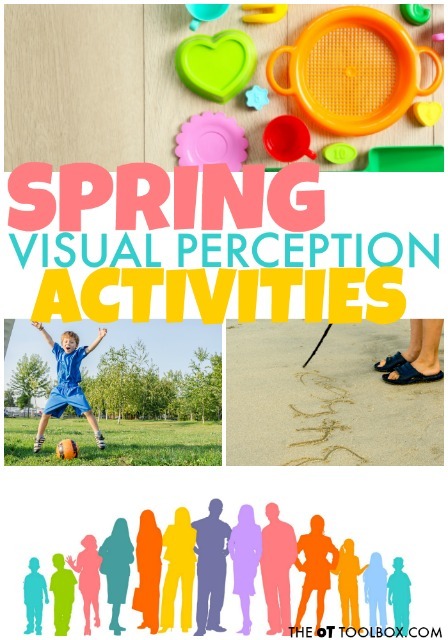 Today you'll find Spring Visual Perception Activities. These are ways to promote visual perceptual skill development and the visual components that are needed for skills like reading, writing, and functional tasks. If you missed the other posts this week, you can check them out here: We covered Spring Fine Motor Activities, Spring Gross Motor Activities, and Spring Sensory Activities already. To see all of the posts from this week (and to see what we're coving tomorrow), head over to our Spring Occupational Therapy Activities page. For more creative strategies and ideas to use in therapy this time of year, you will want to grab our Spring Occupational Therapy Activities Packet. This is a 26 page packet that's on sale for $7.99 this week. It's loaded with tools and ideas to put into place in therapy sessions starting today. Use the ideas in fine motor or gross motor warm-ups, or add them to a home program. You'll find more visual perceptual activities and worksheets that can be used over and over again. 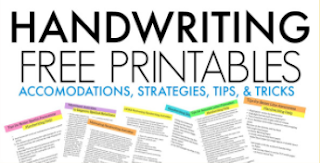 You'll also find handwriting prompts in list form so you can really focus on things like letter formation, spacing, and line use in short writing tasks. You'll love the Spring themed brain break cards that can be used in the classroom or at home. When we breakdown the term "visual perception", you will see that there are many sub-areas that are needed for functional skills like reading, handwriting, spelling, coordination, and many functional tasks. 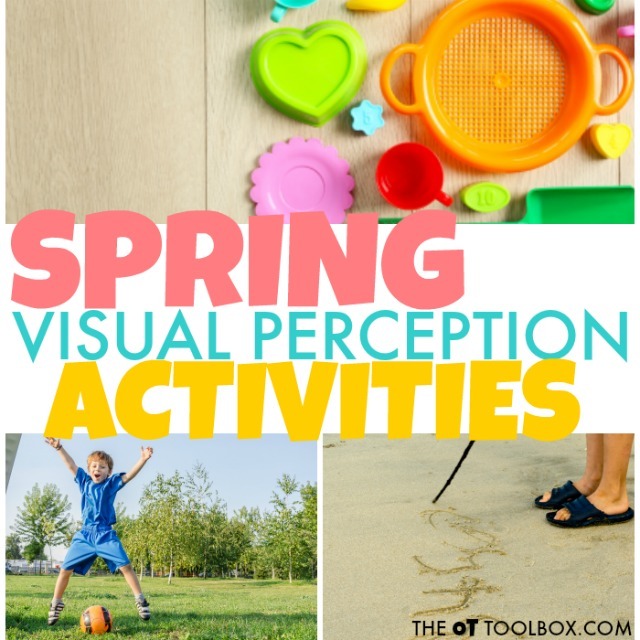 Below, you'll find an explanation of visual perceptual skills that impact function, as well as Spring-themed activities to help improve these areas. Read more about how visual perception impacts handwriting here. Visual Memory- This visual perceptual skill allows us to store information that we see and use that information for future use. In order to recall visual information, we need visual attention. The selection and perception of visual input requires that information is perceived via the eye's visual fields, and in coordination with oculomotor control, is processed through the visual cortex in the brain. This is how visual processing happens. Visual memory allows for discrimination of details of such things as letter discrimination, sight word identification, etc. Use different colored plastic eggs or other items such as mini erasers. Put them in a series of three and show the student. You can then cover up the objects and then ask the student to replicate that series. Create a Spring Memory game. Use pictures or stickers of flowers, chicks, bunnies, caterpillars, butterflies, etc. to create a DIY Memory game. What's Missing Game- Use those mini erasers from a dollar store to create a What's Missing Game. Place a handful of erasers on a tray. Allow the child to memorize the items. Then cover them and remove one or more. The child needs to recall and identify the missing items. Visual Discrimination- This visual perceptual skill allows us to identify the features of a form/object/letter/number so we can tell the difference between objects. Using visual discrimination, we can identify similarities and differences related to the objects and use that information in conjunction with visual memory. Cut a spring picture or card into pieces. Kids can position the pieces to recreate the whole picture. Make this activity easier or more difficult as needed by the child. Use a packet of spring stickers. Many times there are several sheets that contain the same stickers. Use them to make small cards. Mix up all of the cards and ask the child to find the matches. Form Constancy- This visual perceptual skill allows for recognition of objects in various environments or with attention to details and orientation. This allows us to recognize letters or numbers no matter their font or size. Write lists of spring words on index cards in different sizes or fonts, or upper case/lower case letters. Hide the cards around the room. The child can look at one card and go off to find the matching font and word. Using plastic eggs, draw shapes that are similar in form, but are different sizes on each half of the egg. Then, mix up the eggs and as the child to find matches and put them together. Visual Closure- This visual perceptual skill enables the identification of objects or forms and allows us to identify an object by viewing just a portion and using mental skills to complete the object's form in our mind. Visual closure is a skill necessary for reading and recognizing words by viewing just the beginning letters. Visual closure is related to and requires visual memory and visual attention. Gather several Spring-themed items such as small animal figures, flowers, cookie cutters, plastic eggs, etc. Place them on a tray and cover half of the items. Ask the child to name each item without seeing the whole object. Make an "I Spy" Frame- Cut a hole or rectangle in an index card. Place it over a spring picture or item. Ask the child to name the object or item by seeing only a portion. Visual Figure Ground- This skill enables us to locate items in a busy background. Finding hidden items in a hidden pictures puzzle works on this skill by visually scanning and identifying items within a busy scene. In handwriting, visual figure ground is necessary for copying written work from a model and locating the place left off when shifting vision. Use small items such as mini-erasers of various shapes like bunnies, carrots, and flowers. Spread them out on a table in a pile. Ask the student to sort the like shapes into piles. Go on an "I Spy" nature walk and look for signs of Spring. Flip through a catalogue or grocery flier to find specific items on a list. These can be items needed for a Spring event like Mother's Day or Easter, or items needed for a recipe. Make an order of three or more items like three flowers. Ask the student to memorize the order and then to replicate it. Talk about the steps to complete a task such as planting a flower seed. Write out or draw the steps. Cut the paper so the steps are separated. Mix up the order by spreading the various steps on a table surface. Ask the student to place them back into order. Looking for more ways to work on visual perceptual skills? In the Spring Occupational Therapy Activities Packet, you'll find visual perceptual skills worksheets that can be printed off and used over and over again. Even better, you can combine fine motor skills by using manipulative items like play dough, string, pipe cleaners, or items like craft pom poms to mark and match items on these sheets. 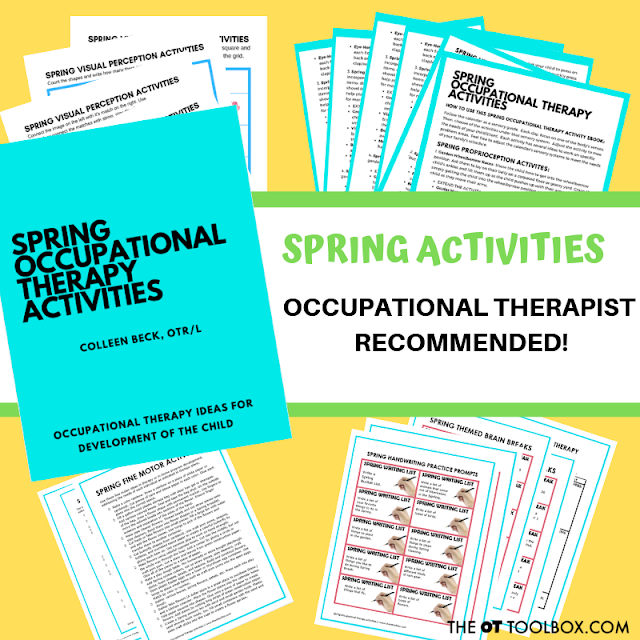 Read more about the Spring Occupational Therapy Activities Packet here. Welcome to day 3 of Spring Week here on The OT Toolbox. Today, we're talking about all things sensory. When it comes to spring and the change in the weather (hopefully), a few sensory-themed activities can be a tool for working on a variety of skill areas, all through play and sensory exploration. Today, we're going to discuss using sensory activities to address corresponding needs. Because when it comes to sensory processing, there can be related areas that are impacted as a result of sensory information being poorly processed and resulting in functional skills and development being impacted. For the child with identified sensory processing difficulties, an effective treatment plan needs to be established, so that the individual can more effectively participate in functional activities. 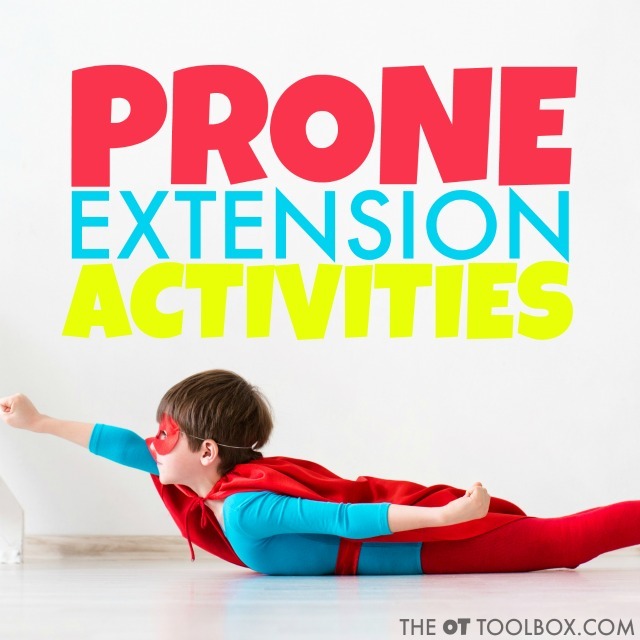 In today's blog post, you'll find some activities and modifications that can be used in the home, classroom, or therapy clinic. 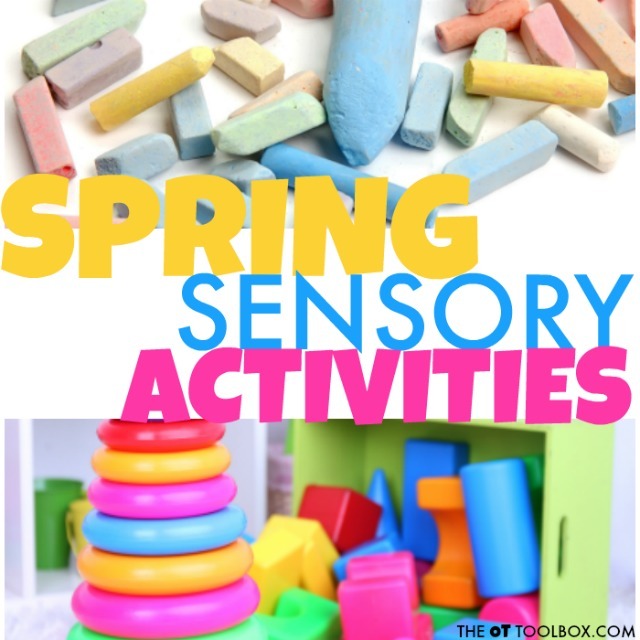 These are Spring sensory activities to add to a therapy plan this time of year. Add them to some of the other ideas being shared this week on our website and in our newsletter to create a themed set of interventions that meet the needs of a full caseload! 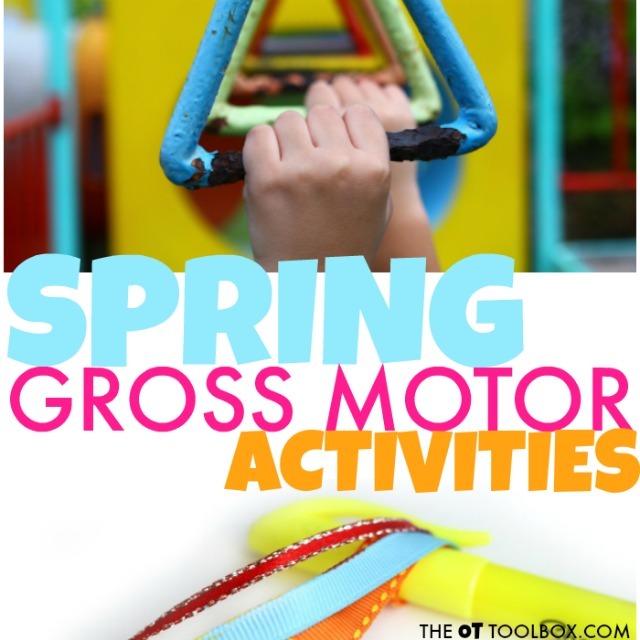 If you missed the Spring Fine Motor Activities or Spring Gross Motor Activities shared earlier this week, you can catch up on our main Spring Occupational Therapy Activities page. 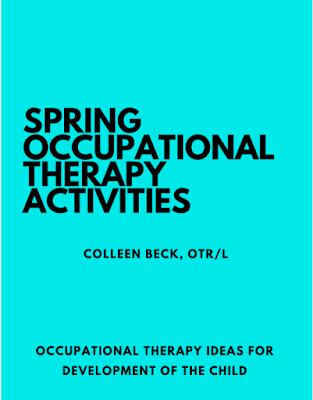 For a more exhaustive set of strategies, activities, and ideas, be sure to grab the Spring Occupational Therapy Activities Packet that is on sale now for just $7.99. You'll be loaded up on all kinds of tools that will last all season long. Bunny Wall Push-ups- Cut out a pair of bunny paw prints and tape them to the wall. This is a place to hop over to and then perform wall push-ups. Egg Rubber Bands- Provide heavy work to the hands by wrapping rubber bands around plastic easter eggs. Kids can try to unwrap the rubber bands and then re-wrap the eggs. Use the bands as a hand exercise for the fingers in extension and in finger flexion. Tug-of-War- Use a rope or sturdy jump rope to pull heavy items from one location to another. Some ideas include a basket or bin full of books or weights. Transport a stuffed animal or plastic Easter eggs in the basket or bin. Sit or lay on a therapy ball to pull the objects out of the bin. Kids can lay in supine on the therapy ball while pulling the rope, too. Make a Spring Trail Mix- Add in crunchy and chewy items such as dry cranberries, small, chopped carrots, fruit leather, small pretzel pieces, bunny crackers or bunny pretzels. Make a Spring Crash Zone- Use heavy blankets, couch cushions, and pillows to create a crash pad area. Hide fake flower tops (remove the stems) in the pillows and blankets. Kids can jump and find various flowers. Give them a specific number or specific color to locate in the jumping area. Leap Frog- Remember the classic leap frog game? It's a great Spring sensory activity! Kids can jump over small items or paper lily pads. In a pinch for time? Just use paper plates for your lily pads. Use craft sheets and draw flowers or "grass" lines with a ballpoint pen. Then, the child can use a felt tip marker to trace the lines in the craft sheet. Allow them to trace with the ball point pen, too. Using the different writing tools provides various feedback in the resistive surface of the craft sheet. This is a great pre-writing lines activity for younger kids. You can see how we used craft sheets to work on pencil control using this sensory technique in a previous activity post. Use a vibrating pen- Create a flower shape or egg shape with Wikki Stix. Then, use the vibrating pen to draw lines or color in the parts of the flower/egg. Use cookie cutters to encourage bilateral coordination of an assisting hand and the dominant hand. Vibrating pens provide great sensory feedback to the hands. Use hot glue or regular school glue to create tracing forms. Write spring words like "sun", "bee", "flowers", "grass", etc. or trace Spring coloring pages with the glue. Allow the glue to dry and then place another sheet over the hardened glue. Use crayons to shade over the raised lines. Here is an example of how we used glue to practice sight words with DIY crayon rubbings with an emphasis on tactile sensory input. Spring obstacle course- Make an obstacle course that requires various motor movements, motor planning, changes in body position, and organization of body actions. This can easily be accomplished with pillows, couch cushions, chairs, laundry baskets or buckets, and everyday items. Use colored Easter eggs or fake flowers to carry through the obstacle course while challenging praxis. Bean Bag Toss- Use several small baskets or buckets to work on motor planning with bean bags. Use visual and verbal instructions to place or toss the bean bags into the targets with either one hand or the other (or a foot by placing the bean bag on the toes!). Use simplified instructions to follow instructions. Downgrade the activity by having the child repeat instructions and steps of the direction. For more assistance with somatodyspraxia, add more cues, simplified instructions, visual cues, and single-step motor tasks. Play Simon Says with a Spring Theme- Encourage bilateral coordination movements and alternating motions to follow directions. Use a Spring theme by saying "hop like a frog", "crawl like a caterpillar", etc. Use stickers or a stamp to identify the left or right hand and foot for these actions. Play Hopscotch- Draw a hopscotch board and draw lily pads or spring flowers on the board. Kids can hop onto the squares. Also try jumping with one or both feet onto the target square. Deep Pressure- Add weights to the wrists or a weighted lap pad along with heavy work to the hands. Try using a large eraser to erase flowers drawn on construction paper. Ask the child to erase the flower completely. Try using lighter pencil strokes and reducing the amount of erasing needed. This is one way to work on pencil pressure, too. Flower-Push- Add proprioceptive input to a gross motor activity that provides heavy work through the whole body. Draw a flower or sun on two paper plates. Place them on the floor and ask the child to place their hands on the flower picture while they get into a push-up position. The child can push the flowers across the floor. Caterpillar Roll- Use a blanket to roll the child up in a log position. The child is now a caterpillar! Add slow and heavy input through up and down the length of the child, using whole hands and slow movements. Add Spring stickers to a weighted lap pad or wrist/ankle weights. Make it fun! Flower Breaths-Try deep breathing activities such as imagining blowing a dandelion fluff across a field. Use deep and slow breaths to imagine moving those flower fluffs away. This can be helpful before participating in an activity that requires motion that can be a challenge for the child, such as when riding in a car. 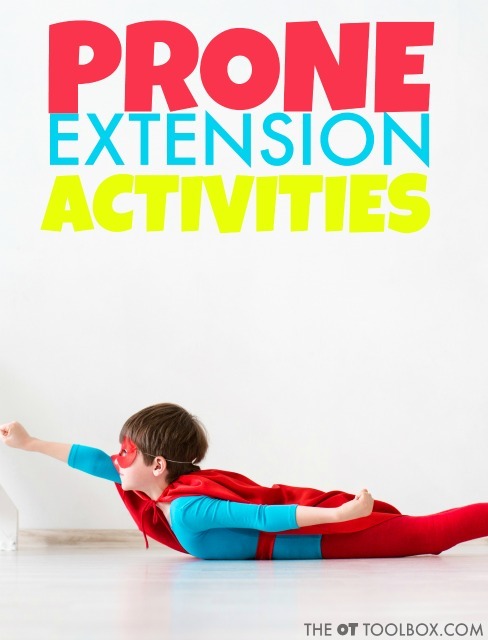 Looking for more ways to promote sensory activities through movement and play? 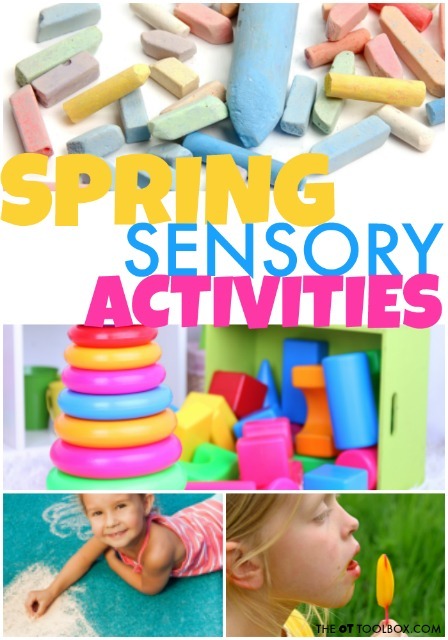 The Spring Occupational Therapy Activities Packet has activities for each sensory system and challenges areas like bilateral coordination, oculomotor skills, eye-hand coordination, fine and gross motor skills, and more. You'll also find Spring-themed brain breaks that can be used to add proprioceptive and vestibular activity into daily tasks. The Spring packet has everything you need for activities this season! It's a 26 packet of activities with strategies to grade up or grade down the ideas to meet the various needs of a variety of kiddos. You'll find ideas to work on visual perceptual skills, sensory processing, handwriting, fine motor skills, gross motor skills, bilateral coordination, motor planning, and so much more! The packet is only $7.99 and can be used over and over again for every student/client!